It's looking less and less likely that a faraway star's strange dimming was caused by some kind of "alien megastructure." 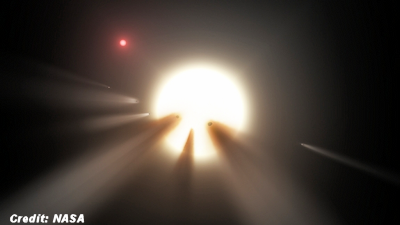 Observations by NASA's Kepler space telescope recently revealed that the star KIC 8462852's brightness dipped dramatically several times over the past few years, by 22 percent on one occasion. Such dimming events are too significant to be caused by a planet crossing the star's face — Jupiter passing in front of the sun would dim our star by just 1 percent or so — so some astronomers have speculated that the KIC 8462852 system might harbor a giant complex of orbiting solar panels or some other structure built by an intelligent alien civilization. In a test of this hypothesis, a team of scientists hunted for signs of potential laser communications coming from KIC 8462852, which lies about 1,500 light-years from Earth. But this search — which took place over six nights from Oct. 29 through Nov. 28, using the Boquete Optical SETI Observatory in Panama — came up empty, the researchers report in a new study. "We found no evidence of an advanced civilization beaming intentional laser signals toward Earth," study co-author Douglas Vakoch, president of SETI (Search for Extraterrestrial Intelligence) International in San Francisco, said in a statement.